Mulayam Singh Yadav wishes re-election for PM Narendra Modi: The moment Mulayam Singh Yadav wished that PM Modi become Prime Minister again, it triggered speculation of a new-found bonhomie between the two political leaders, also party rivals, of the country. Frenetic news tickers screamed of dissent from the veteran on the BSP alliance a thought senior SP leaders have been airing in private quarters. The possibility of a post-election ally toast is also being speculated upon. For all its worth, let's put this thought also out in the public domain: politics is what is practiced silently and without the cameras whirring. as a surprise to many in the Opposition benches and the media because Mulayam’s son and current SP boss Akhilesh Yadav is a vociferous opponent of Narendra Modi and continues to challenge the Bharatiya Janata Party government in the state and the Centre. Akhilesh has also allied with the Bahujan Samaj Party led by Mayawati to counter the BJP in the 2019 Lok Sabha polls. Though it is assumed that Mulayam has okayed the alliance, it is not a secret that he doesn’t get along with Mayawati given the age-old rivalry between the two parties given their caste antipathies. 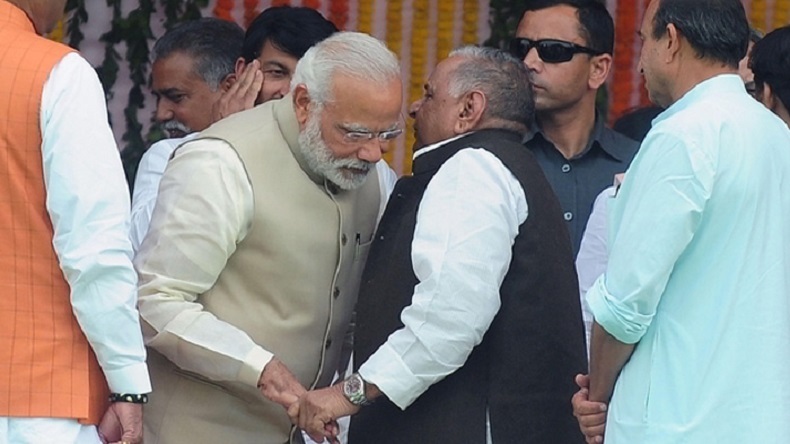 The moment Mulayam Singh Yadav wished that PM Modi become Prime Minister again, it triggered speculation of a new-found bonhomie between the two political leaders, also party rivals, of the country. Frenetic news tickers screamed of dissent from the veteran on the BSP alliance a thought senior SP leaders have been airing in private quarters. The possibility of a post-election ally toast is also being speculated upon. For all its worth, let’s put this thought also out in the public domain: politics is what is practiced silently and without the cameras whirring. A veteran leader like Mulayam wishing Modi good luck can also be nothing more than parliamentary etiquette and fine manners. After all, who will say anything otherwise in Parliament with the majority so against one’s party. Former Congress president Sonia Gandhi, who was sitting next to Mulayam Singh Yadav, seemed to have got the message even though it was light on sarcasm. Modi himself thanked Mulayam for his generous wishes. It’s as if the PM could gauge the mischief the Lohiaite veteran was up to. It was after all the last day of the 16th Lok Sabha. Public memory is very short. To quote an example from cinema, people have gotten over Sridevi, Madhuri Dixit, Priyanka Chopra et al. Now, it’s Alia Bhatt ruling the roost. Similarly, speaking nice things about your political rival need not be plain old post-election wisdom. It could be manners and simple generosity. become a prime minister. The then young man fulfilled the prophecy some 40-odd years later by becoming Prime Minister Atal Bihari Vajpayee. As a young journalist, Vajpayee never left a stone unturned to criticise and attack PM Nehru. His disregard for the Congress giant was such that he once called him a patient suffering from split personality. Despite being on opposing sides of the political spectrum, Pandit Nehru had introduced Vajpayee to a foreign dignitary saying one day, this young man will become the country’s prime minister. Politicians of the generation Mulayam Singh Yadav belongs to are on the decline. His wishes today may just be the ointment needed for the better functioning within civil norms of Parliament which has been like a wheel stuck between the bricks of opposition walkouts for the last 10 years, thereby neglecting the work MPs are elected to office for – make laws.